The Texas Commission on Environmental Quality invites 6th to 12th grade Texas students to participate in the Take Care of Texas Video Contest (Contest). The contest runs from Sept. 4, 2018, through Dec. 14, 2018. To enter, students must create a 30-second video that portrays positive ways Texans can help keep our air clean, keep our water clean, conserve water, save energy, or reduce waste. There will be a total of six big winners! Waste Management of Texas Inc. will provide the prizes—GoPro camera packages and scholarships. The TCEQ will invite 1st place winners to Austin to be recognized at the 2019 Environmental Trade Fair and Conference. Contest rules and dates may be changed at the TCEQ’s sole discretion. Video must portray positive ways Texans can protect the environment in their daily lives, including keeping the air clean, keeping the water clean, conserving water, saving energy, or reducing waste. Students are encouraged to explore just one of these topics. Video must include the slogan “Take Care of Texas. 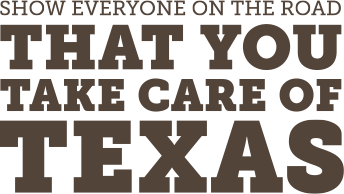 It’s the only one we’ve got.” The slogan can be expressed either verbally or by using the Take Care of Texas logo provided on our Video Tips page. TakeCareOfTexas.org is the only allowable source for statistical information, facts, and data. Groups cannot enter the contest. While students may work in groups to create a video, only one student may be listed on the Video Contest Entry Form and Agreement and this student will be awarded the prize. Each student may submit only one video. Videos may not have been previously submitted, distributed, or aired or have won any other award in any other competition. Video must be 30 seconds long. The recommended video quality is 1920p by 1080p. Students must submit a video script. Video must be original work created by the contest participant. Students may receive guidance from a teacher, parent, or guardian. All video and music content must be original and royalty free or the student must submit written permission from the copyright holder granting use of the copyrighted material. All unoriginal content—such as music, video, or images—and the artist name, title of work, and direct URL. Unoriginal content includes any part of the video that was not created by the student—including but not limited to stock music, video, or images. All facts, statistics, and other information used in the video, and includes the URL for the sources. Video must not contain any copyrighted materials such as company logos, product brands, or store names. Any video containing such video or audio references may be disqualified. No obligation or liability is assumed by TCEQ in connection with the contest. All submitted videos are owned by the TCEQ. Winners and their parents or guardians agree to the use of the winners’ names/likenesses to promote the Take Care of Texas program and future video contests. See Video Contest Entry Form and Agreement for further details. Texas middle- and high-school students—whether from public, charter, or private schools or homeschooled—are eligible to participate. Applicants must be current residents of Texas, must be enrolled in 6th through 12th grade as of Dec. 14, 2018, and must comply with these Official Rules. Employees and their immediate families (spouses, parents, siblings, children, and each of the respective spouses or other people living in the same household of each) of TCEQ or WMTX are not eligible to participate. The entries will be divided into two age groups: middle-school and high-school. Ability to gain the viewer’s attention and make a lasting impression. Inclusion of the slogan “Take Care of Texas. It’s the only one we’ve got.”, either expressed verbally or with the logos provided on the Video Tips page. Quality including characteristics such as accuracy, creativity, persuasiveness, clarity, and overall visual and audio production quality. How well it conveys positive ways to take care of Texas. There will be three rounds of judging, including a round of public voting. Public voting will take place starting Jan. 10, 2019 at 8 a.m. and end Jan. 24, 2019 at 4 p.m. CST. The top 12 videos submitted to Take Care of Texas will be posted on our website and the public will get the chance to vote for their favorites. There will be six from each age group. The top three from each age group, will then go on to the final round of judging. In the final round of judging, commissioners and executive staff from the TCEQ and representatives from WMTX will pick the first-, second-, and third-place winners from each age group. Entries will be judged by TCEQ staff, the public, the TCEQ Commissioners and Executive Office, and representatives from WMTX. Videos will be disqualified if they do not include the slogan, “Take Care of Texas. It’s the only one we’ve got.” or the Take Care of Texas logo provided on the Video Tips page. There will be six big winners and WMTX will provide the prizes. Winners will be announced on February 28, 2019. 3rd place, GoPro HERO6 Black Package (approximate value $430). If the GoPro model listed is unavailable, an equivalent model will be awarded. The middle and high school students who win first place will be invited to Austin, along with their teacher, parent, or guardian, to be recognized by the TCEQ Commissioners and WMTX at the 2019 Environmental Trade Fair and Conference. All winning videos will be showcased on the Take Care of Texas website, on social media, at the 2019 Environmental Trade Fair and Conference, and in media announcements. Prizes for middle school winners will be distributed by May 15, 2019. High school prizes will be distributed no later than the first semester following the Video Contest Award. Participating students must upload their entry on or before 4:00 p.m. CST Friday, Dec. 14, 2018 CST, with the required documents. The TCEQ is not responsible for errors with uploading entries. Students are encouraged to submit their videos early to avoid being disqualified due to uploading errors. Late entries will not be accepted. Videos submitted with incomplete information may be disqualified from judging. Video file labeled with the student’s first and last name. Maximum file size is 200 MB. Video Contest Entry Form and Agreement in .pdf. A Reference Sheet. See instructions for the Reference Sheet under the Video Requirements section of these Official Rules. Video script in .pdf, .docx, .txt, or .rtf. Videos and their required documents should be uploaded to the following URL: takecareoftexas.org/video-contest-submission. If you have questions, contact us at educate@tceq.texas.gov.